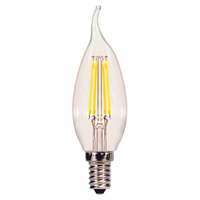 This filament LED is aesthetically designed to look like a traditional incandescent light bulb. Featuring a sleek, new appearance this LED is ideal for use in open-design fixtures. It produces a warm white light perfect for chandeliers, sconces, outdoor fixtures and post lanterns.